The computer is exact, authors are not. Authors are lazy and sloppy, so mistakes slip though. We hope these common text conventions and text idioms will help you understand what the authors probably meant. # this is a comment, in bash, python, and many other languages. $ mycommand  # <- you would type [mycommand] at your prompt. # you type the rest of the line *as is*. >>> # don't type the chevrons! type the command as written, substituting in for things like mydir as appropraite. your and my tend to imply whatever it is you chose. Typically single chevron implies heirarchical nesting. Most commonly, this is used when describing GUI (graphical user interface) commands. For the purposes of these tutorials, these all mean ‘the command line bit where you interact with the system. Authors tend to be sloppy and conflate these. On UNIX-like systems, where ‘your stuff’ lives. Typically written with the tilde ~ character. Often, the cd command will take you to your home directory. Ex: ~someuser might expand to /Users/someuser (on OSX). in a web context: open a url in your browser, or follow some link by clicking. at the prompt: cd or change directory to some path. save the file to the file system. in a web context: look around at the page, see what links are there. Alt., view source (often by ‘right-clicking’ on a web page). In a CLI context, use commands like pwd, ls and friends to see what files are in a directory, how large they are (using ls -l), etc. When doing so, one should be thinking about why those files are there, what they do, etc. 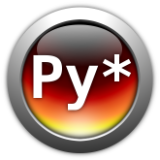 In a Python context, use dir(mything), help(mything), print mything and the like to discover its properties and values. Which of these are unix commands, and which are Python commands? # I don't know what is going on here! python. it imports the time module. could be either :). It’s a comment, in any case! Go to http://some/url. Save the source as somedir/source.html. “Explore your home directory.” What might the author expect you to do?